As a parent, there are things that happen that you never thought you would experience. For me, having a child with a learning disability is one of those things. A long time ago, I was a school social worker in charge of organizing and facilitating IEP meetings, and now I’m signing pages and agreeing to services as a parent. You may recall my concern over Zachary’s reading and especially his writing skills. He has had difficulty with writing since pre-K, when he refused to even make a mark on a paper. As far as reading, he was considered on track until the end of first grade, when he fell behind. This year, it has becoming painfully clear that his difficulty with writing is not normal. As I have been saying, when you are in kindergarten and you write like a kindergartner, it’s normal. When you are in first grade and you write like a kindergartner, it’s acceptable. When you still write like a kindergartner in second grade, it becomes worrisome. 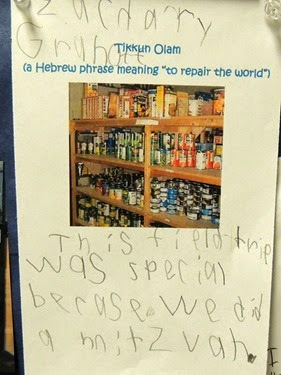 Beginning of this school year – “I am thankful to see my friends.” and December – “This field trip was special because we did a mitzvah.” (He wrote this over from his writing journal). For reading, Zachary has been going to the resource room and his teacher sends me progress notes. His reading is improving, as in the beginning of the year he read 31 words correctly in a minute and most recently he read 75 words per minute – which actually meets the mid-year goal for second graders. He also has been working with a private tutor once per week. We had his eyes tested at an eye doctor and he does not need glasses. 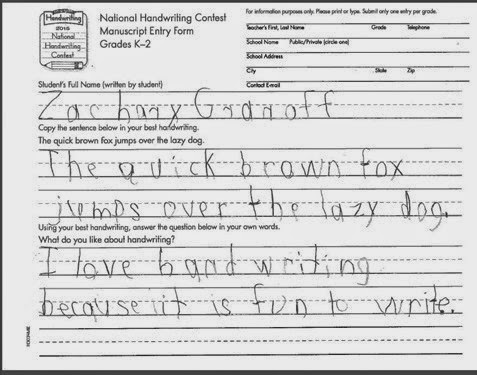 He sees an Occupational Therapist for help with his body awareness and muscle strength, which may be effecting is handwriting. 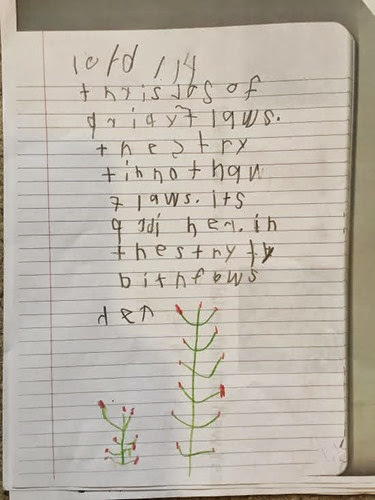 As far as his handwriting, if he concentrates, he can write letters correctly, though when he reverses letters, I am not sure he realizes they are wrong. It makes me sad that he wrote that it is fun to write, because writing is hard for him. In fact, when asked to write a wish for the Jewish New Year, he wrote that he wished he could write better. His problem is when trying to express himself in writing, he cannot get his thoughts onto the paper in a way that is legible to anyone besides himself. His letters are backwards or in the wrong place, letters are left out or mixed up, and words are spelled incorrectly. Much of the time, his teacher writes his thoughts out for him. From October, but this is the most recent example I have of an unedited piece of Zachary’s writing. At our most recent meeting, the team decided that Zachary has a “specific learning disability in the area of written expression.” This means that he is eligible for services through the school district to help him with his ability to spell and to therefore express himself in writing. I admit that it is difficult for me to know that Zachary has this problem. I do not have experience with learning disabilities in myself or other family members. I hope that the extra support from the school district will help him improve, and otherwise I hope that in the future his teachers will be willing to work with him to support his individual needs. My worst fear would be his school being unable to work with him (since he does not go to public school) but so far, they have been supportive and helpful. If anyone out there has any advice or has experienced something similar, I would love to hear from you.